Still Life. Stopping before Cezanne's painting, I see exactly what there is to see. A rough-hewn table. Burnished fruits rolling off a solid white plate. The shining curve of a wine glass, empty. Curtains folded back into a thick darkness. A window or wall. And a pitcher painted with flowers. 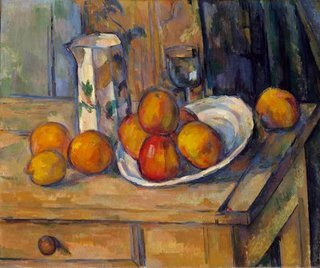 Of course, this painting on the wall of Oslo's National Gallery isn't Cezanne's only work titled "Nature Morte." He painted this scene or one quite like it many times, over and over again. And even though I took Art History classes in college, I couldn't have begun to tell you why. Until yesterday. Last semester, I had the opportunity to work with author Jane Brox . Even though I received sound, encouraging feedback on each of my submissions to her, I still felt that I was struggling. Of course, I had to meet my deadlines with her while living in an empty house in California (all of my possessions were on a cargo ship somewhere on the Atlantic), missing Jonathan (who had moved to Oslo ten weeks ahead of me), and then I had to find the time to write, revise, and submit one last time while making the final move overseas. I pulled it off, but barely, and I was thrilled when summer came and I had a break. Jane saw me through those tumultuous few months. She handled every submission with care, and when I received her critiques by mail, I read them hungrily. Two or three times. She has a way of putting her finger through the pulse to the true heartbeat of any problem. Or, as she's more generous than I am with my work, I'll say she found a way to outline the foundational "challenge" I was facing when it came to my writing. "In a way, yours is the challenge of the still life painter, who places before her a mortar and pestle, a ceramic bowl, a few onions, and a copper pot to paint. If the painter sees only those objects as physical things to be painted and nothing else, then the painting can't really go beyond the realm of an exercise. But painters like Chardin or Cezanne or Morandi saw something more in the objects they set before themselves to paint: the objects in front of them and the ideal. They brought to the canvas particular ideas about shape and form and color and perception that infused their work. They spent countless hours arranging the objects so as to give the whole specific shape and form and flow. These things might not be apparent to the casual observer but they are apparent to anyone who really looks at the work. They were painting the objects and they were painting much more than the objects at the same time." 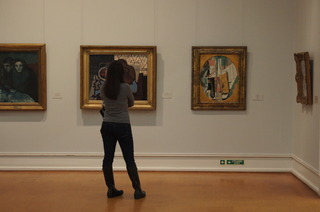 I stood before Cezanne's painting in the museum here in Oslo, only a few blocks away from where I live now. Admission is free on Sundays, so it was crowded today. People moved around me slowly, pausing to tilt their heads reverently to one side before the works of the French masters, then moved on, the damp soles of their shoes and boots squeaking against the tile irreverently. All of my current writing centers on Oslo, my life here as an expat: everything from adventures to disasters to the monotonies of my day-to-day. And so, as a non-fiction writer who is not an actress, inventor, athlete, hero, or wannabe celebrity, I find myself constantly haunted by one question: Who cares? Well, a few people, those that love me and want me to succeed. Those that like to read my blog. Those that like to receive birthday cards from me because they know I'll ramble on in ink on the inside cover. Those who will feel absolutely required to buy my book one day because they'll be scared to death I'll come to their homes and stare at their bookcases and demand to know where the hell it is! (Note: This would never actually happen. But still...) But is there an audience for such writing beyond my own small circle of people? Possibly. And I can increase the odds of such an audience existing by thinking like a true master, like Monet, Van Gogh, Picasso. Like Cezanne. What is more interesting to the average person who doesn't know me than my life in Oslo? Life in Oslo. Life as an expat. Life in general. Life is what we all know and what we all fail to understand. It is the source of all curiosity. That is my bond, that is every protagonist's bond with the world. The character I am writing about, Audrey Jean Camp, is no one, but she is also everyone. She represents something appealing: the ideal that is an adventure beyond the boundaries drawn for us all by time, money, education, and circumstance, by fate. Audrey cannot live up to that ideal, of course, but if I take authority over this story I'm writing, the story Audrey Camp is living here in Oslo right now, I can give an accurate representation of the still life, the nature morte, what IS. And at the same time I can allow what is possible, the ideal life, to shine through. I can write truth while still being keenly and actively aware of an ultimate shape, a flow, a form. I can do this. But will I find a way to pull it off? The weeks and months of this master's program rush by so fast, it's easy to let the wisdoms of one semester flounder away as I reach toward the next residency, the next mentor, the next goal. Giving Jane's critiques another read, I realized how far ahead of me she'd actually been last spring. She wasn't only commenting on the few ramshackle essays I'd scraped together at that time. She was calling the whole game, addressing the central issues which were and would and are and will be impacting my thesis and, ultimately, every piece of writing I attempt in my lifetime. Did she know she was seeing so far into my future? Probably not. But Jane Brox is one of the wisest, most stoic and considerate people I've ever met, so I wouldn't put it past her. Below: Considering another Nature Morte, this one by Picasso.